Welcome to Kentucky. The Bluegrass State is famous for breeding horses, tobacco farms, fine bourbon, and, of course, the Kentucky Derby. The state is home to a stellar system of state parks and natural attractions, featuring lakes, hardwood forests, spectacular waterfalls, and magnificent caves. The history and lore of Kentucky is interwoven with legendary figures, stories, and song. A sampling: Daniel Boone, explorer, hunter, and woodsman who cleared the Wilderness Road and founded Fort Boonesborough; James Bowie, who designed the Bowie knife, became a Texas Ranger, and later died at the Alamo; Kit Carson, trapper, scout, and Indian agent; Jefferson Davis, who became president of the Confederate States of America; Carry A. Nation, the Temperance Crusader; Abraham Lincoln, Mary Todd Lincoln, the McCoys of the Hatfield-McCoy dispute, and Casey Jones, who became immortalized in song. Singers, musicians, and songwriters have honored Kentucky for generations, from Bill Monroe, "The Father of Bluegrass Music" with his classic Blue Moon of Kentucky and My Rose of Old Kentucky ; to The Coal Miner's Daughter Loretta Lynn and her Blue Kentucky Girl ; to Stephen Foster's My Old Kentucky Home , now the official state song of Kentucky. For those who want to know, John Ed Pearce, a Kentucky journalist, tells about six of the most notorious and long-running feuds of Eastern Kentucky - those in Breathitt, Clay, Harlan, Perry, Pike, and Rowan counties. Find out if Big Jim Howard really did kill Governor William Goebel? Did the Hatfield-McCoy fight start over a hog? Find out in Days of Darkness: The Feuds of Eastern Kentucky . 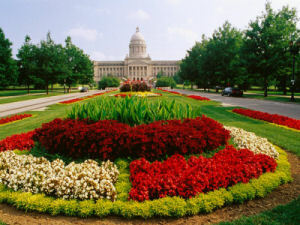 Kentucky comes from the Wyandot Indian name for "plain" in reference to the central plains of the state. This common nickname for the Kentucky is given because of the vast expanses of Bluegrass across parts of the Commonwealth. Bluegrass is not really blue. It's green. In the spring, however, when seen from a distance, the blue-purple buds of Bluegrass lend a bluish tint to the landscape. Hemp was one of the two most notable crops of Kentucky. This nickname originated based on the importance of this crop to the Commonwealth. Tobacco, the other notable Kentucky crop is the source of this nickname. At one time, about 2/3 of the national Tobacco crop was produced in Kentucky. This nickname may have originated as a reference to the poorer people living in the mountainous regions of the Commonwealth. Another theory has it that this nickname is derived from a crane that was common in Kentucky. This crane was said to make a "craking" sound and was called a Corn-crake. Some have proposed that "Corn-cracker" is a corruption of "Corn-crake." his nickname refers to the Indian battles, between Creek, Shawnee, Chickasaw, Cherokee and other tribes, that took place along the Cumberland River in Kentucky and Tennessee. Some have said that the land was described in this way to Daniel Boone by an Indian Chief. According to The Kentucky Blue Book , "Dragging Canoe, a young Cherokee chief opposed to selling ancestral hunting grounds, warned the whites that they were purchasing a "dark and bloody ground." People who live in or come from Kentucky are called Kentuckians. On October 18, 2001 the Kentucky quarter was officially unveiled in front of "My Old Kentucky Home" in Bardstown, Kentucky. The Kentucky quarter is the fifteenth quarter to be released in the U.S. Mint's 50 State Quarter TM Program and the final quarter to be released in 2001. The quarter shows the Bardstown mansion, Federal Hill, built by Judge John Rowan in 1818. Federal Hill is commonly referred to as "My Old Kentucky Home". Tradition has it that Stephen Foster, Judge Rowan's cousin, wrote the official Kentucky song, My Old Kentucky Home while staying at Federal Hill. To the right of the stately mansion, an inscription on the coin reads "My Old Kentucky Home." In the foreground, a thoroughbred racehorse stands behind a plank fence. 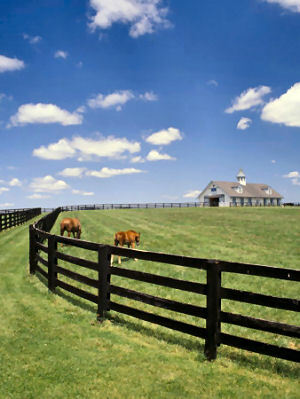 Kentucky is well know for its rolling Kentucky Bluegrass region, for horse breeding, and for its horse racing. In fact, Kentucky is home of the longest running annual horse race in the country, the Kentucky Derby. The thoroughbred is the official horse of Kentucky. Kentucky (From Sea to Shining Sea) , by Suzanne M. Williams. 80 pages. Publisher: Children's Press(CT) (December 2001) Reading level: Grades 3-5. Presents information about Kentucky's people, geography, history, landmarks, natural resources, government, state capitol, towns and cities, and more. Kentucky (World Almanac Library of the States) , by Miriam Heddy Pollock. 48 pages. Gareth Stevens Publishing (July 2002) Reading level: Grades 4-6. Filled with the most up-to-date information, including the latest Census results. Full-color photos bring to life the story of Kentucky. In addition to an in-depth factual profile of Kentucky in the form of a state Almanac, this book offers fascinating and lively discussions of the state's history, people, geography, government, economy, culture, and lifestyles. A section on Notable People, a calendar of events, and enough primary source documents, time lines, maps, and other tools to make this unquestionably the best young adult reference material on the USA available anywhere. Clark's Kentucky Almanac and Book of Facts , The Clark Group. 784 pages. Publisher: The Clark Group; 2nd edition (November 22, 2006) This Second Edition of Clark's Kentucky Almanac & Book of Facts brings together a wealth of information about Kentucky's rich history, contemporary facts, notable personalities, sports, recreation, government, counties, and so much more. It features over 700 photographs, and vital statistics in one comprehensive volume. With over 300 new photographs and hundreds of new articles and statistics, this 784-page Second Edition is sure to become a bestseller as quickly as its predecessor. This fascinating book makes a great all-occasion gift! A Concise History of Kentucky , by James C. Klotter and Freda C. Klotter. 256 pages. Publisher: University Press of Kentucky (March 1, 2008) A Concise History of Kentucky recounts the events of the deadly frontier wars of the state's early history, the divisive Civil War, and the shocking assassination of a governor in 1900. The book tells of Kentucky's leaders from Daniel Boone and Henry Clay to Abraham Lincoln, Mary Breckinridge, and Muhammad Ali. The authors also highlight the lives of Kentuckians, both famous and ordinary, to give a voice to history. A collaboration of the state historian and an experienced educator, A Concise History of Kentucky is the best single resource for Kentuckians new and old who want to learn more about the past, present, and future of the Bluegrass State.